Welcome to Garfield Gardens. We are a small grower of daylilies located in Lonsdale Minnesota and we hope you enjoy our selection of plants. Our daylilies are very hardy withstanding winter temperatures as low as -30° F. They are also resistant to drought and heat. Daylilies will grow well in half shade to full sunlight. They are rugged, vigorous perennials that can thrive with little care. We dig and ship daylilies from late May to September 15th. Daylilies can be planted throughout the growing season. 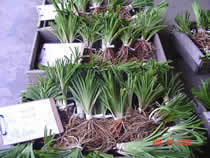 We send you freshly dug plants with large divisions from our State inspected garden. The less time the plants are out of the ground the better. We recommend planting as soon as possible after receiving your shipment. Our garden is open to the public mid July with hours from 9:00 am to 7:00 pm weather permitting. For other dates or times please call for an appointment. Peek bloom is mid- July. We also welcome garden clubs and other groups. Our daylilies are reasonably priced, with prices as low as $2.95. We can only take orders within the continental United States. To order daylilies select Our Daylilies. This will show a picture of the daylily, the price and a description. If you click on the image of the daylily the image will become enlarged. You can order daylilies by clicking on “Add to Cart” and using Pay Pal or printing up the order form and mailing it to Garfield Gardens. Thank you for considering Garfield Gardens for your daylily perennials. Copyright © 2019 Garfield Gardens. All rights reserved. Duplication without written permission is prohibited.